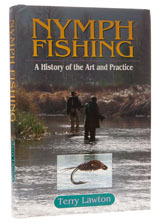 For some reason, nymph fishing is regarded as a recent invention, but it is more accurate to describe it as a rediscovery; as anyone who has ever watched a traditional hazel and horsehair fixed line fisherman will tell you, nymphing must be an ancient practice. Using a traditional six foot rod and fixed line more or less forces you to nymph and even the least observant practitioners of the method rapidly learn to watch the fly and strike when a fish turns. This book falls into the age-old trap of assuming that the origins of all fly fishing lie in Western Europe, with the result that the first chapter is entitled ‘Why did nymph fishing take so long to develop?’ – when it would be more accurate to call it "Why did anglers take so long to name the method?" What Skues did was to work out the science behind nymphing, differentiate it from chuck it and chance it wet fly fishing and adapt it for use with modern equipment. His views took a long time to gain traction, but once they did, the upstream nymph was widely exported, while some sections of the British angling establishment managed to remain peculiarly snotty about its use at home. If you treat this as a book about how nymphing was refined in this country during the late nineteenth and twentieth centuries, then it is perfectly acceptable, but if the first edition has the luck to sell out and a second is ever considered, it would be good to see the author cast his eye a little further back in time.